Today, I am happy to have Amy Silver, author of One Minute to Midnight on my blog today telling us about her fantasy dinner party for New Year's Eve. Amy's book is set around New Year's Eve and is an absolutely fabulous read, definitely one you need to see the New Year in! New Year’s Eve should be all about decadence, extravagance and frivolity. There are dinner parties where I would dearly love to be sandwiched between Charles Darwin and Gertrude Stein, but not this one. This one is purely about fun. For this party, in honour of One Minute to Midnight, we’re off to New York. We’ll have dinner around the pool on the rooftop of Soho House – I’m told the pool’s heated so we could all strip off and jump in if we get too cold. As I said, New Year’s Eve is no time for serious discussion – there are no politicians on my list, and no religious figures, no one to drone on about the future of the Eurozone. Instead I’ve invited brilliant wits, renowned raconteurs, writers, bon vivants and, of course, the odd bit of eye candy. Adventurer, writer, Nobel prize nominee, possible syphilitic. Best known for Out Of Africa, her novel about life on a coffee farm in Kenya, Karen Blixen, the Danish author who wrote under the pen name Isak Dinesen, was a storyteller in the old tradition. Her life offered up a wealth of fascinating material: after an unsuccessful affair with one second cousin, she married his brother, the Swedish aristocrat Baron Bror von Blixen-Finecke who, depending on who you believe, may or may not have given her syphilis. They moved to Africa just before the First World War where they faced drought, famine and divorce, while Blixen fell in love with a dashing big game hunter by the name of Denys Finch Hatton. She lost him to a plane crash in 1931 and, with the farm failing, she was forced to leave Africa where she lived out her days as a writer. I think it’s Blixen’s spirit I most admire: when she moved to Africa, she wrote: “Here at long last one was in a position not to give a damn for all conventions, here was a new kind of freedom which until then one had only found in dreams.” Now there’s a woman after my own heart. I have a soft spot for pre-1975 Rolling Stones. Such great songs. Wild Horses, Satisfaction, You Can’t Always Get What you Want… all that bluesy guitar and frustration and longing, Mick’s dodgy dancing, drugs, drama and impossibly beautiful women. Intoxicating. And while I wouldn’t mind spending an evening with any one of them, Keith’s definitely the pick of the bunch, if only to ask his secret: how is it possible to behave quite so badly for quite so long and still keep going? I think we should be told. He might not be to everyone’s taste, but I simply refuse to be believe it would be possible to be bored in any room which also contained Keith Richards. Another musician, this time the woman hailed as the greatest jazz vocalist of all time. Billie Holliday rose to fame singing a song about a lynching (‘Strange Fruit’), a condemnation of racism which was highly controversial in the 1930s and which brought her adversity as well as celebrity. Against a backdrop of a troubled personal life, multiple addiction problems (heroin, alcohol), and facing a constant battle against the racism and sexism of the time, Holiday continued to perform, recording some of the greatest records of her era, including Summertime and God Bless the Child. If we’re lucky and she’s feeling in the mood, she might serenade us after dinner. 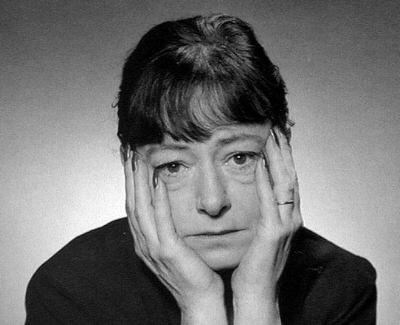 I’d probably be terrified of Dorothy Parker if I actually met her. This is, after all, a woman who once wrote in a New Yorker book review: “This is not a novel to be tossed aside lightly. It should be thrown with great force.” Famed for her membership of the Algonquin Round Table, a collection of writers and journalists who lunched together almost every day at the Algonquin Hotel in New York, Parker wrote hundreds of poems and essays, and like most of my other invitees, she lived a fascinating, if not always happy, life. She worked through a string of husbands and lovers and found herself blacklisted as a Communist during the McCarthy era thanks to her outspoken support for the various anti-fascist groups and the civil rights movement. This was a passion she never lost: when she died her estate was bequeathed to the Dr Martin Luther King Jr Foundation. (By the way, if anyone’s ever in the vicinity of the Algonquin Hotel in New York, I can highly recommend the cocktails in the Blue Bar next door). 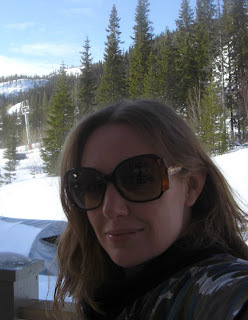 Psychopathy – the lack of conscience – is a bit of a fascination of mine. And while I understand that not everyone would relish the idea of sitting next to a psycho at dinner, I would love to, just once. 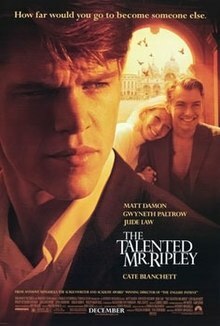 Particularly if he looked like Matt Damon. Yes, my psychopath of choice is Tom Ripley, the anti-hero of Patricia Highsmith’s The Talented Mr Ripley, the “suave, agreeable and utterly amoral” chameleon who used his dubious charms to borrow and steal other people’s lives and other people’s money. Cultured and sophisticated, he is a lover of food and wine and art and would no doubt make a fascinating dinner guest. Just don’t leave him alone with anyone and keep him away from the carving knife. More eye candy here. 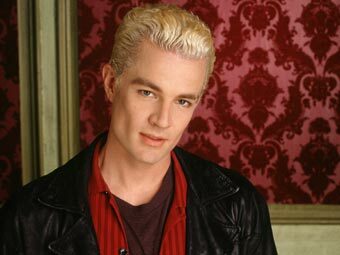 Blonds aren’t usually my thing, but who could resist Buffy the Vampire Slayer’s Spike? The sardonic wit, that black leather coat, the tendency to fall for dangerous women – what’s not to love? Okay, the penchant for bloody murder is a drawback, but so long as he has a chip (or a soul) we’d be okay. Plus, he’s over one hundred years old, so he must have plenty of sparkling dinner party repartee. One day, I’d like to write a crime novel. 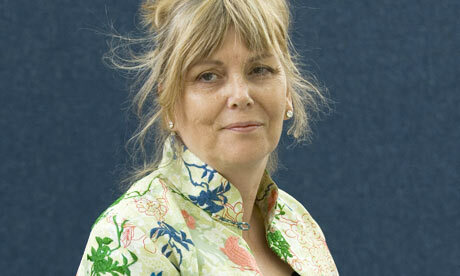 And if I could write a crime novel even half as good as the ones Kate Atkinson writes, I would be a very happy girl. Funny, poignant, heart-breaking, fiendishly clever and chock full of insight into the human condition, Atkinson’s books are ones I return to again and again. I’d love to have a few hours (or days) to chat to her about her work, in particular about her development of utterly believable, often problematic yet completely sympathetic characters. One of the most elegant players ever to grace a pitch, Zinedine Zidane was balletic and beautiful to watch. And despite the weird, tonsured haircut, pretty easy on the eye when you see him up close (I ran into him in a hotel in Libson once). And not just a great footballer, a decent family man (a rare thing indeed in that sport): he’s been married for over two decades, has four sons and – as Marco Materazzi found out to his cost – he’ll headbutt anyone who says mean things about his mum. Thank you Amy for a fabulous New Year's Eve fantasy dinner party. I am just going to make some extra room so that I can sit next to Johnny Depp! Wow what an amazing party that would be! The food sounds delicious, and what a list of attendees! That would be a pretty unforgettable New Year's Eve. Sounds like an amzaing party, I await my invite and could you make sure I have a seat next to Spike please. And the company would suit me as well. Very well! What a fantastic dinner party that would be! I *heart* Johnny Depp.